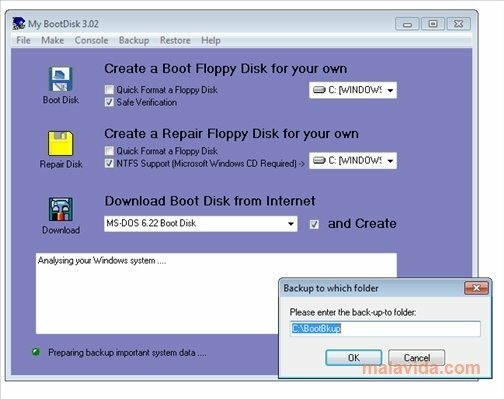 My BootDisk is a program that will probably be able to get you out of more than one problem, when your computer is affected by a virus or any other computer disaster, because it is an application with which you will be able to create boot disks that will allow you to restore the operating system or repair any damage that it may have suffered. The program's interface is rather dull and it lacks nice menus, but it is rather intuitive, because all the controls are visible and, due to this, they make it easier to use the application. 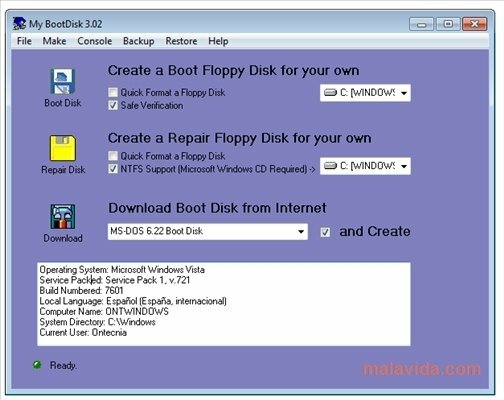 The discs that can be created with this program will have all the files necessary to be able to access any storage unit on your PC via MS-DOS, and thus be able to delete the data that may be affected or, on the contrary, to restore or reinstall the system. If you are looking for a program with which you can create boot discs in a matter of minutes and in the most simple manner, you may need to download and start using My BootDisk, a simple and effective application. You can use the trial version for 15 days.